Mount Lico is an inselberg mountain in the Alto Molocue District of Zambezia Province in northern Mozambique, most notable for its old-growth rainforest and its lack of penetration by humans. Mount Lico is approximately 1,100 metres (3,600 feet) above sea level but is distinctive in having sheer rock walls of up to 700 metres (2,300 feet) above the surrounding countryside which have prevented almost all human intrusion. The forest on top, within a volcanic crater, covers only about 30 hectares (0.12 square miles). In 2012 Mt Lico was "discovered", or more correctly, identified as a place of special scientific interest, by Julian Bayliss of Oxford Brookes University, who had earlier similarly identified Mount Mabu some 70 kilometres (43 miles) to the south-west, by using Google Earth to search for significant landforms and vegetation features. In May 2018, Bayliss led a multidisciplinary expedition to scale the sheer walls of Mount Lico and begin the study of its unique habitat. Although it had been considered unlikely that humans would have entered the mountain's forest prior to this expedition, evidence of some limited human visitation was discovered in the form of several pots which had been placed, possibly for religious reasons, at the source of a stream on the mountain top. ^ "The man who discovered an unseen world". BBC Earth. Retrieved 2019-03-07. 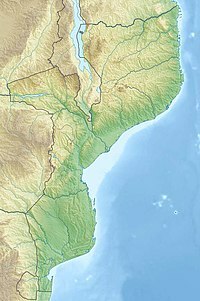 ^ "Mozambique: the secret rainforest at the heart of an African volcano". The Guardian. 17 June 2018. Retrieved 29 August 2018. ^ "Secrets revealed: Researchers explore unique, isolated forest in Mozambique". Mongabay Environmental News. 2018-10-19. Retrieved 2019-02-28. ^ "The Secret Garden: How Google Earth led a team of scientists to discover an untouched mountaintop rainforest". TheVerge.com. 28 August 2018. Retrieved 29 August 2018. ^ "Why we explored an undisturbed rainforest hidden on top of an African mountain". TheConversation.com. 29 June 2018. Retrieved 29 August 2018.